Decorate your Christmas tree with these adorable, non-edible gingerbread ornaments! 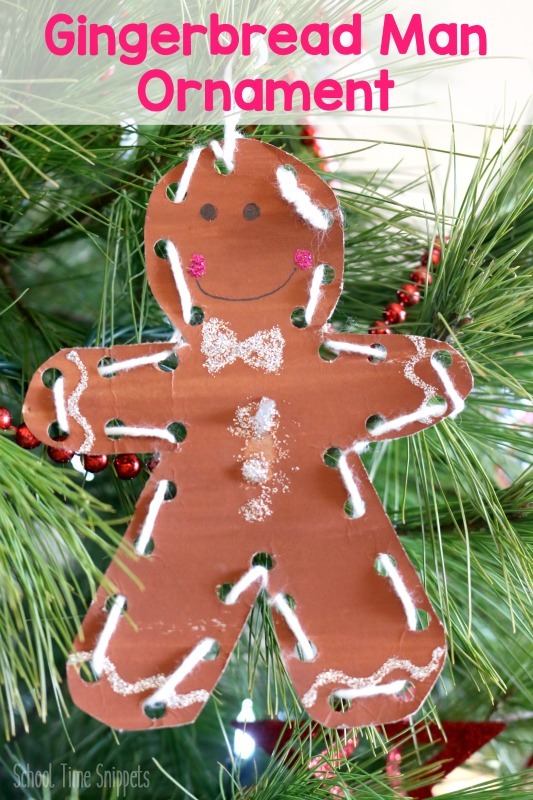 This gingerbread man activity for preschoolers is great for little hands. 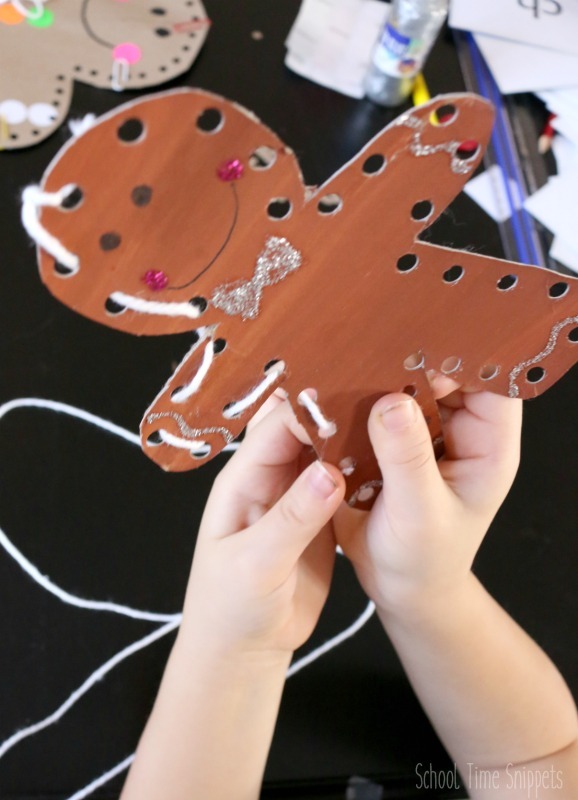 Unleash creativity and work on fine motor skills as he/she creates their own gingerbread man ornament! Gingerbread men aren't just for eating! Make an adorable non-edible gingerbread ornament for the Christmas tree.... although, this craft may make you hungry some cinnamon, brown sugar, and molasses goodness! Oh, if only I could snap my fingers and a magical Christmas fairy would leave a plate of gingerbread cookies as I write this!! ... One can wish! If you really wanna know, I am drooling over these Gingerbread Bars with Cream Cheese Frosting!! But the next best thing besides eating gingerbread, is filling this holiday season with various gingerbread man crafts!! 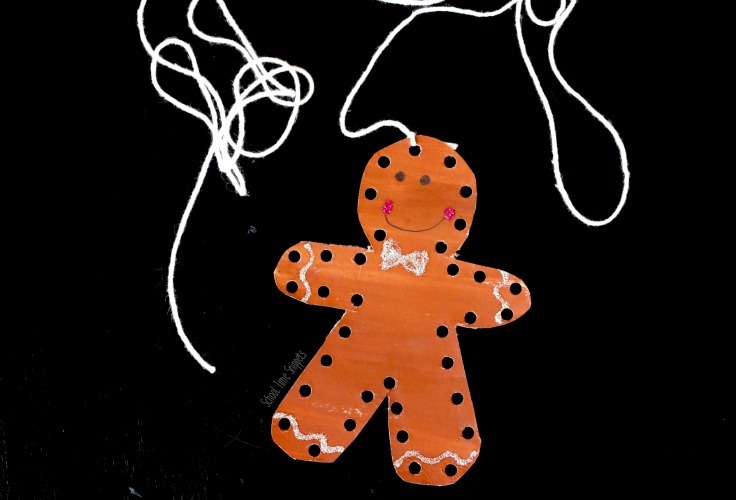 This gingerbread man ornament is great for preschoolers! ... and this Non-Edible Gingerbread Ornament! From a cereal box (or similar), trace and cut out a gingerbread man outline. 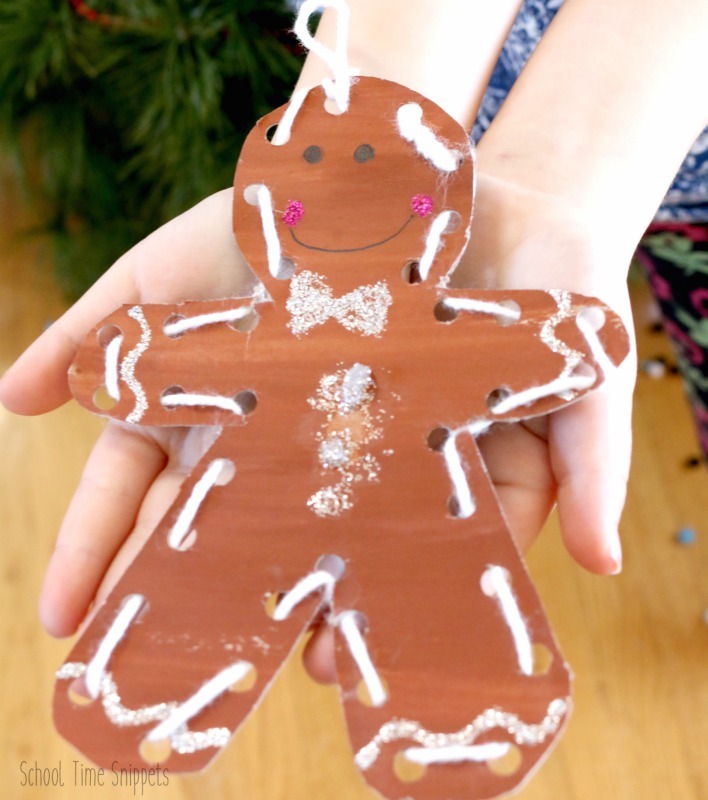 Have your child paint the gingerbread outline with brown paint. Allow to dry. Once dried, add glitter glue decorations like a bow-tie, rosy red cheeks, and wavy lines. Add eyes and a mouth with a sharpie marker or regular ball point pen. Next, with a hole punch, work around the gingerbread man outline creating holes about 1/2-1 inch apart. More holes = more lacing, which may mean hands tire quicker. Less holes = less lacing. Knowing your child's abilities and limits, space the hole punches accordingly. Tie an end of the white yarn through one of the holes. Have your child begin lacing the thread in and out around the gingerbread man's body. This white yarn gives the gingerbread ornament some "icing!" Continue lacing the white yarn around the gingerbread man's body til you reach the hole where you started. Tie the ends together, and then create a loop and tie again so that you can hang your gingerbread ornament on the tree! Isn't this gingerbread ornament so adorable?! I could just eat it up!! 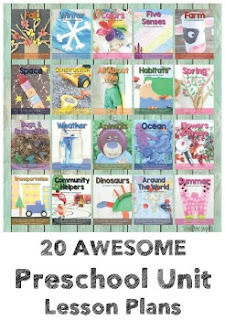 Find more Kid-Made Christmas Gifts, Ornaments, & Cards at Teach Me Mommy! This Snowman Money Holderfrom Kimspired DIY is a fun way to gift gift cards! These Cocoa Christmas Tubes from KidsMinds would be a fun gift to give neighbors, friends, and/or would make great stocking suffers! Have a golfer in the family? Why not gift them with a colorful set of Golf Balls from your little artist(s)? Make up some simple kid-made Christmas cards using recycled wrapping paper! 1 comment on "Adorable Gingerbread Man Ornament for Little Hands"
Adorable! Thanks for joining the Kid-made Christmas series!